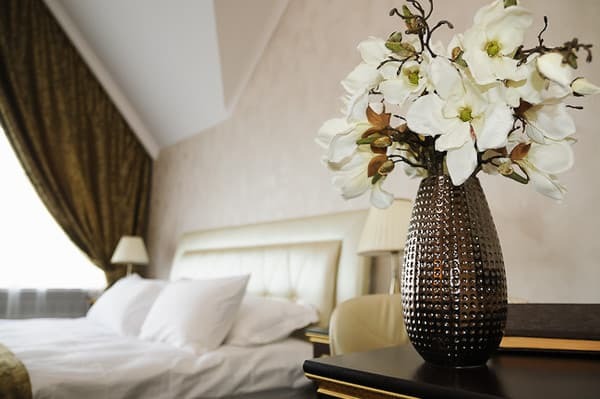 “Art apartment Vettriano” Hotel is located in the prestigious area of Donetsk, on the shore of the reservoir, in a green area but at the same time in a close proximity to the business district, shopping centers and the famous "Donbass Arena". The hotel offers 9 comfortable rooms of different categories: King, Business-Suite and Suite. Spacious rooms with high ceilings have everything you need to stay: minibar, safe, telephone, air conditioning, hair dryer, radio, desk, bathroom amenities, satellite TV. Free Wi-Fi and free parking is available. There are shopping centers and the famous "Donbass Arena" near the hotel. Railway Station is 9.1 km away the hotel, bus station - 4.4 km. Description of the room: Cozy room with a beautiful view of the park area and a reservoir, a total area of ​​25 square meters. m, is equipped with everything necessary for comfortable stay of guests. 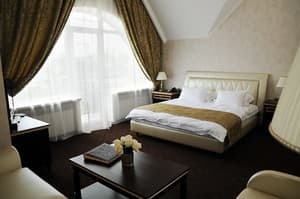 Description of the room: All rooms, the total area of ​​each room of 35 sq.m, have a convenient layout, large panoramic windows, from which a wonderful view of the city and the park area. The room is equipped with everything necessary for a pleasant pastime. Description of the room: Room with a total area of ​​45 square meters. m, which consists of 2 rooms and due to a convenient layout, and a large area can act as a full family number. Each room has a bedroom with a large comfortable bed, a seating area with upholstered furniture and a coffee table. Все понравилось )) огромное спасибо персоналу ! Children up to 5 years stay free of charge (if extra bed is not needed). 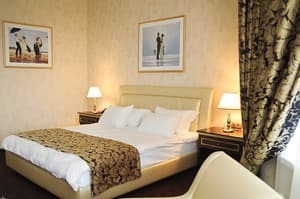 “Art apartment Vettriano” Hotel is located in the prestigious area of Donetsk, on the shore of the reservoir, in a green area but at the same time in a close proximity to the business district, shopping centers and the famous "Donbass Arena".